If you are over a certain age you will probably remember a little box of tricks called the Commodore 64. It was all the rage back in the 80s and somehow managed to stay on the market for a whopping 12 years before finally ending production in 1994. One particular game that made its mark was an Andrew Braybrook-designed title called Uridium. It was an addictive top-down shooter that used some clever visual tricks that still looks good even by today’s standards. Hyper Sentinel is a Kickstarter-funded spiritual sequel of sorts to that 1986 classic, and also happens to be co-developed by the son of Uridium’s original publisher, Andrew Hewson. Developed in collaboration between Four5Six Pixel and Huey Games, Hyper Sentinel takes you on a nostalgic trip across the galaxies as you eradicate swarms of enemy forces known as the Alienoids. You fly above a series of armoured intergalactic dreadnoughts with the aim of destroying the allocated number of ground targets fixed to the surface, followed by an end of level guardian for you to try and conquer. There are 12 stages in total to fly through in the Arcade Mode, which makes for good practice to ready yourself for the more brutal Survival Mode challenges. The controls are incredibly basic and easy to pick up with little more than shooting and your speed boost at your disposal. Your navigational abilities simply consist of moving vertically up and down to avoid danger and to find targets, while moving your left stick laterally will allow your sentinel to do that famous Uridium-style flip. In executing this stylish U-turn mechanic you will be granted a tiny window of invincibility as soon as you begin to soar in the opposite direction. This little gameplay mechanic is a lifesaver at times and a skill to master in its own right. What makes this particular control system a little bit different to the usual side-scrolling shooter is that flicking your left stick either up or down will appoint you into an invisible lane so to speak – think moving a Tetris block around the screen as a somewhat rough example. This comes in handy when it comes to space management and target aiming to boost your score multipliers or just generally staying alive. With a bit of experience, you soon begin to find other little gameplay traits that you will discover and take advantage of to give you that edge on the scoreboard. There are also special weapons and perks that can be collected for a temporary helping hand, like a pair of physics-based medieval-style bommy-knockers or a powerful dual-energy beam to cause havoc with. On the surface, it doesn’t seem much more than a horizontal game of Space Invaders in a way where you think you have pretty much seen everything after the first few levels. To be fair, you wouldn’t be wrong in thinking this to be the case, as the structure does tend to stay very similar throughout. Where the depth does begin to show its face is when the difficulty begins to increase or when you start ticking off the five-star objectives appointed to each level. The Survival Mode that’s specifically attached to each stage is where you will really do begin to test your fast twitch skills and coordination. However, this isn’t a game that everyone will take to. Some may acquire the taste for it, others may very well relive their childhood through it. However, I could see a lot of younger, modern gamers lose interest in it very quickly. Which is fine. After all, not every game must cater for everyone and it’s clear who the target audience is in this particular case. In saying that, the game difficulty is well catered for the more modern, (ahem…) softer generation of gamers with its Halo-style rechargeable health in Arcade Mode. The rechargeable energy does happen to work quite well however when it comes to riding out those tense moments when staring death in the face. I couldn’t help but feel that there were a few things that could have fitted in better with Hyper Sentinel. For a start there are three difficulty levels, one of which is titled “Retro.” This, of course, is the hardest setting and quite a challenging one at that. The thing is, there was no regenerative health in the olden days so it was a shame to see it still present in this difficulty. Don’t get me wrong, it’s tough enough at my personal skill level, but it would have been nice to have the option to turn it off for the Jedi’s out there. Another thing that I noticed was the lack of a retry option in Arcade Mode. It would have been nice to be able to instantly restart the level when hunting for those five stars, as opposed to being forced to exit into the main menu to have another crack at it. Finally, as addictive as the Survival Mode is, your score is time-dependent and ignores traditional scoring based on kills. I can understand why this choice is put in place, I just would have like to have a comparison of the number of enemies destroyed as well. When it comes down to visuals and sound, Hyper Sentinel stays well within the time period that has heavily influenced it. Everything looks as though it’s been dragged out of the earth from a time capsule and tinkered slightly with modern technology. The developer has made a point to call it “Neo Retro,” which I found such a perfect way to describe this sort of game that I’ve decided to nick the term for myself from now on. There are even CRT, Spectrum and C64 filters to mess with although I found the Spectrum one pretty much unplayable if I’m honest with you. I also found that the depth can skew a little too closely together on a fair amount of levels making it quite difficult to separate interactive obstacles from the general backgrounds. This can create problems in the more chaotic moments, especially because they are usually both the same colour. 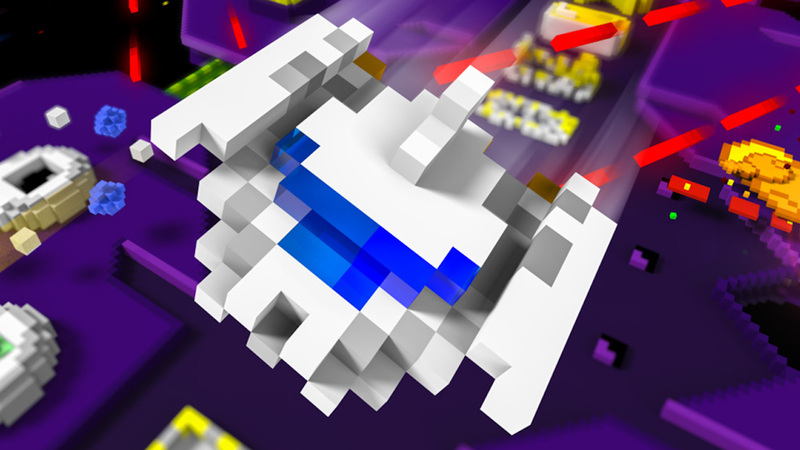 Hyper Sentinel does a great job of bringing a classic formula into the modern world of gaming. Its addictive and fast gameplay sinks that hook deep enough into those who want to make a dent on the online leaderboards. Sure, it probably won’t pull the kids away from Fortnite any time soon, but it does make you feel like you’re getting a taste of history without relying too much on the nostalgia. Hyper Sentinel is a smartly priced game for those that want to have a blast over the weekend to fork out for, and provides enough content and challenge to cater for both the casual and the insane gamer alike.